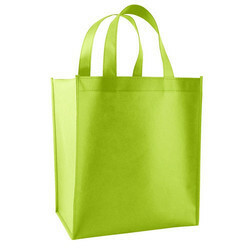 Non Woven Box Bag With Loop Handle offered is made available in virgin PP material finish. We are dedicatedly involved in trading a wide array of Non Woven Loop Handle Bag. Being a leading firm in this industry, we are deeply engaged in offering a high-quality range of Loop Handle Bag. We manufacture wide range of stylish and trendy Designer Handle Loop Bag. Also, we ensure that only quality raw material is procured from the renowned vendors in the industry. These products are available in market at most economical rates. We offer an exclusive range Elegant Loop Cut Bags that are available in hand loops and is widely useful in carrying various kinds of products. These are manufactured using high quality raw materials that meets international quality standards and are widely demanded due to high durability, excellent service life and reliability. - Size : 14" *19" / H 16"